Mo Weiland, a recent graduate of the University of Denver Sturm College of Law, an Educating Tomorrow's Lawyers consortium school, recalls her first volunteer case as both unexpectedly challenging and very informative for her developing career. Representing her client through a difficult divorce, Weiland saw her role as a lawyer extend beyond that of simply a legal advisor, and evolving further into that of a counselor and confidant. 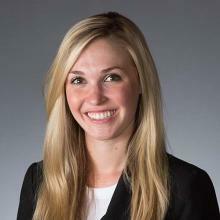 This professionally transformative case became the most valuable experience within her first year of practice, and Weiland sees such volunteer opportunities as a way to get more experience as a young attorney while also providing a valuable public service. Weiland suggests that this mutually beneficial relationship could provide an answer to two problems presently facing the legal profession: 1) the “glut of young professionals who want experience” and need it to find jobs in a tough market and 2) the “huge population stumbling through the legal system” in desperate need of a lawyer and counselor. Students at the University of Denver will have the ability to get such hands-on legal experience with the opening of the Resource Center for Separating and Divorcing Families, modeled by the Honoring Families Initiative. The interdisciplinary project will train law students, in addition to graduate students in social work and psychology, to provide educational, non-adversarial dispute resolution, legal, therapeutic, and financial services and referrals for reorganizing families.